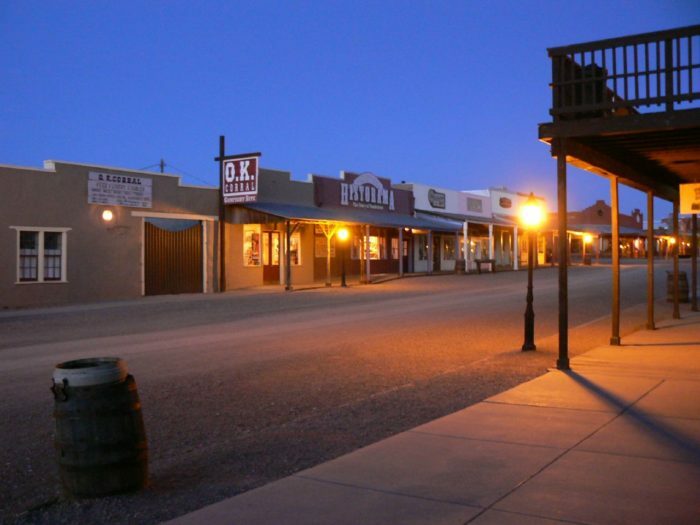 If there’s any state that could be considered the ghost town capital of the country, Arizona could easily win that argument. 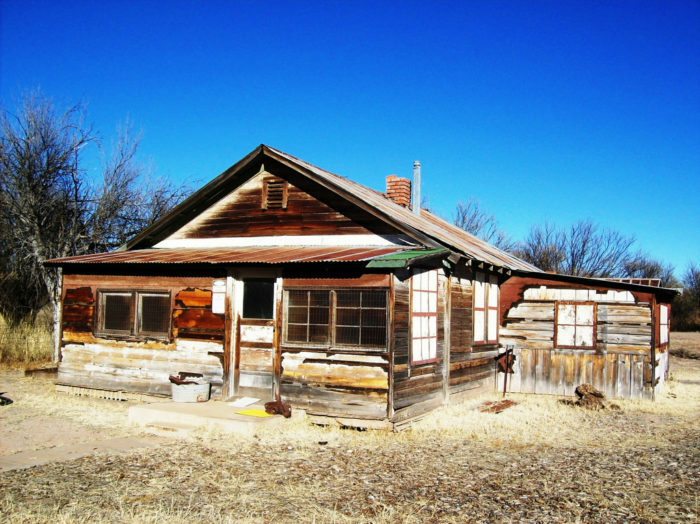 With more than 275 abandoned settlements of American origin, many of these places were frontier boom towns iconic of Arizona’s Wild West heritage. Today, many still exist in various stages of decay and each year, a little bit fades away into the land. 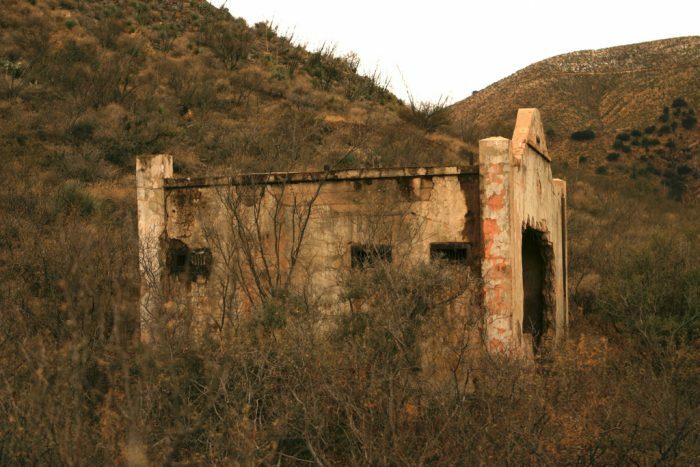 If you’ve been meaning to take some time to explore these long-forgotten areas, you’ll definitely want to take a trip on this special ghost town road trip in southeastern Arizona! 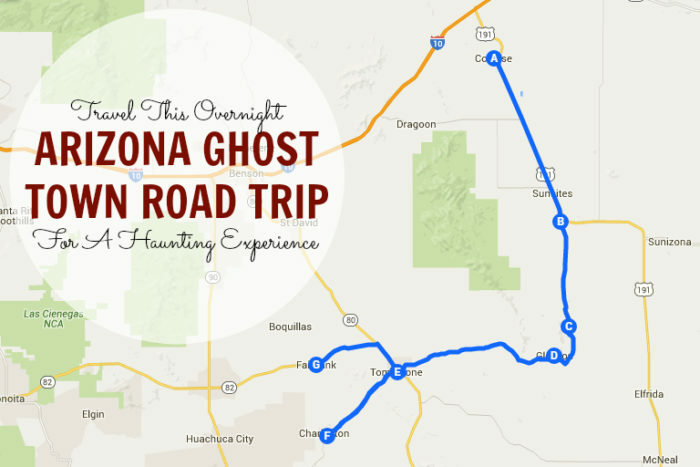 On this trip, we’ll be exploring 7 places often designated as ghost towns and some of the history behind each one. Refer to this custom Google map we created just for this road trip for directions and a few facts about each town. Could the road trip be done in one day? Sure but it’s less fun if you just drive through the towns! 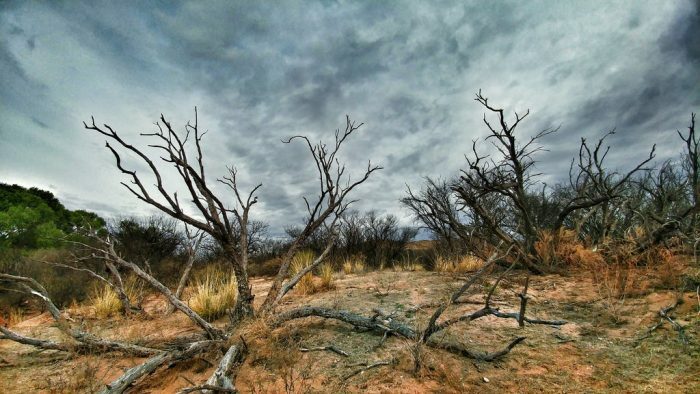 So, pack an overnight bag, bring plenty of water, and get ready to see a forgotten side of Arizona. This town was founded in the 1880s as a railroad stop and at one point had a thriving population of 3,000. It is best known for the Cochise Hotel, where Doc Holliday's lady friend, Big Nose Kate, worked after his death. 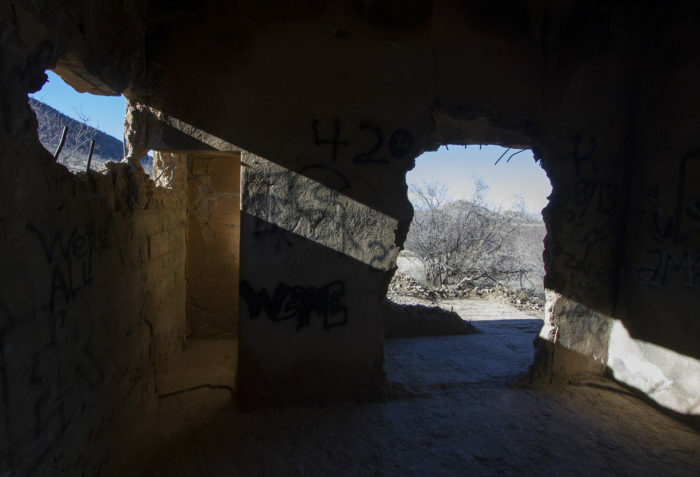 Although labeled by most sources as a ghost town, the town had a population of about 1,500 in 2000 and some accounts claim that has dwindled to just 50 today. Expect to spend about 20 to 30 minutes here driving through town and looking at some of the old buildings that are in need of renovation. 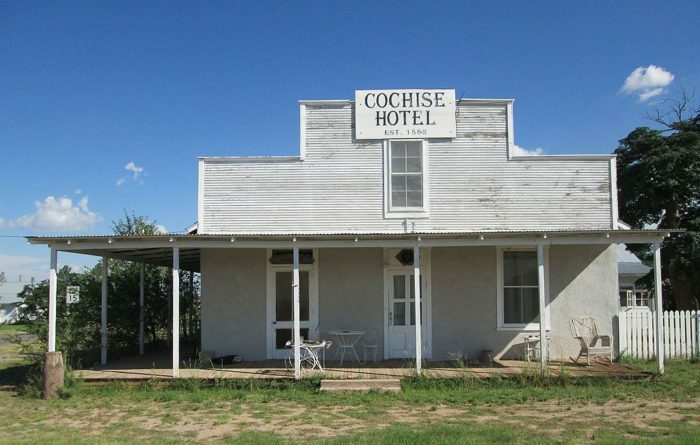 The Cochise Hotel, located at the southern corner of Cochise Stronghold Road and Rath Avenue, is one place that is actually getting some love. Phillip Gessert, the new owner of the deteriorating hotel, stated on a website dedicated to the historic building that it is currently being restored. You’ll also want to check out the Cochise Country Store just across the street and the little Cochise Church on Bowie Avenue. Found 16 miles southeast of Cochise is Pearce, another old mining ghost town that has become absorbed by the larger Sunsites. The town was founded shortly after gold was spotted in 1894 and the development of the nearby Commonwealth Mine. Once a thriving community, the town slowly began to decline in the 1930s and nearly died when the mine closed for good a decade later. These days the town’s population is pretty low but you’ll still find some folks living here. When counted with the nearby Sunsites and a couple of other nearby communities, the area overall has a population of 2,100. Pearce is a small place but it does have some interesting areas to photograph and explore. One spot you definitely want to stop for a visit is the Pearce General Store, which dates to 1896 and now serves as a museum and tourist shop. The store is locate at the southwest corner of Ghost Town Trail and Pearce Road. Other nearby sights include the Pearce jails, abandoned buildings, and the Prickly Pear Emporium. Courtland is a true ghost town that sits 9 miles directly south of Pearce and is a mere 15 minute drive away. 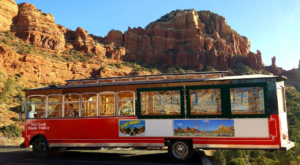 In terms of age, this town is relatively young; it was founded in 1909 during copper’s mining heyday and evidently was a lively town with a more friendly atmosphere than plenty of other boomtowns in Arizona. In fact, only one murder was documented in Courtland, which happened in 1913 when a waitress shot her boyfriend during an argument about another woman. The good times didn’t last though. One decade after its founding, the mines yielded far less copper than was profitable to mine and the town’s population slowly dwindled until the post office officially closed in 1942. Completely abandoned, there’s not much to see in Courtland these days. Only vague remains sit within the town’s old boundaries but the town jail is one spot that has managed to survive the ravages of time. The two-cell jail was built in 1909 and cost a mere $1,000 to build. 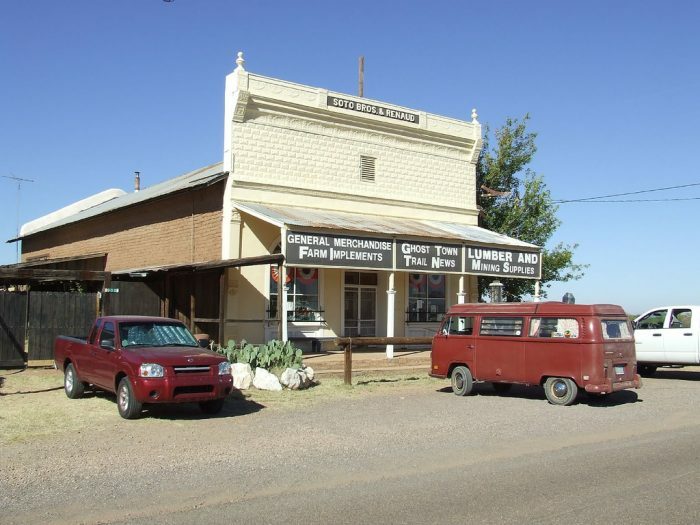 The next stop on our road trip takes us down the Ghost Town Trail to Gleeson, a former mining camp settled at the base of the Dragoon Mountains, about 5 miles from Courtland. The town was briefly known as “Turquoise” in the 1870s for the semi-precious stone found in the area. The town was then abandoned in the 1890s for gold mining nearby. In 1900, the town came to life again when miner John Gleeson opened the Copper Belle Mine. This lasted for about 30 years when the mines were closed and people slowly moved out of town. These days Gleeson is a ghost town despite the fact that a few people still live in the area among the ruins. Some of the sights to see here include the Gleeson jail (which was recently renovated), a hospital, a saloon (pictured above), and plenty of other remaining structures. Just remember to be respectful to the remaining residents! The final stop for the day is 16 miles west, the infamous Tombstone. Founded in 1879 for nearby silver mining, it was the largest boom town in the area with a population total hitting 14,000 at its height. 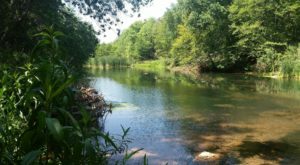 However, the good times only lasted until the turn of the century, when the water table (which previously was being pumped out) began to flood the mines. This led to mines being shut down, a hefty population decline, and a ghost town destiny. 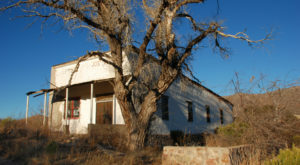 Although some people consider Tombstone to be a ghost town, it’s small but steady population prevented that designation, making it the “town too tough to die.” However, its historic status and popularity led to good preservation so that today we can experience what many of the other ghost towns on our list looked like in their heyday. This is the last stop of the day for good reason: there’s so much to do and see around here! 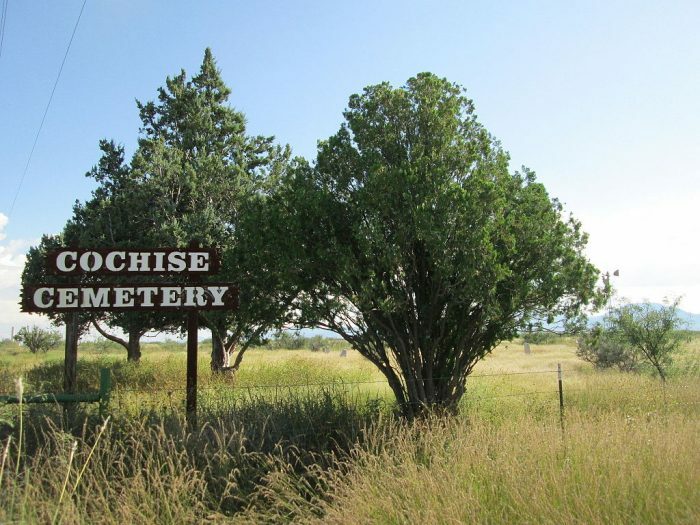 A few suggestions include the Cochise County Courthouse, Boot Hill Cemetery, as well as the saloons and other businesses found along Allen Street. 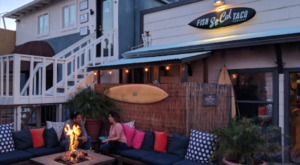 We recommend getting dinner and spending the night here; you’ll have plenty of options to choose from, including guest ranches, bed and breakfast inns, and inexpensive motels. Rest up because tomorrow will be an active one. Charleston is located almost 9 miles southwest of Tombstone along the two-lane Charleston Road. It was founded the same year as Tombstone (1879) as a settlement for silver ore processors in the nearby Millville along the San Pedro River. Charleston grew to a small population of about 400 with a good number of businesses and was a surprisingly quiet place despite East Coast newspaper attempts to paint it as a violent, debaucherous town. The settlements didn’t last long. 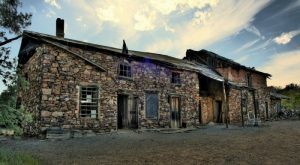 After Tombstone’s mines began flooding in 1886, the mills closed and residents began moving elsewhere until it was completely abandoned. These days you’ll still find some remnants of Charleston but it requires some amount of hiking to get to the ruins. In Charleston, you’ll find some adobe and stone foundation ruins, as well as evidence of the old mills in the nearby Millville. You could easily spend a couple of hours here walking along the banks of the San Pedro River and exploring the area. Drive 8.3 miles from Tombstone, then make a right onto a little dirt road that leads to the Sky Islands Traverse trail. 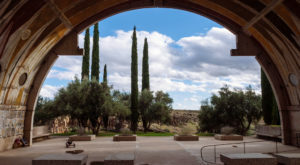 The area is managed by the Bureau of Land Management, which has made efforts to maintain the ruins and trails leading to them. Fun fact: The Sky Islands Traverse will take you on a path to our next stop, Fairbank, but it is an 8-mile journey by foot. Unless you really want to hike 16 miles, you might want to just drive to Fairbank. 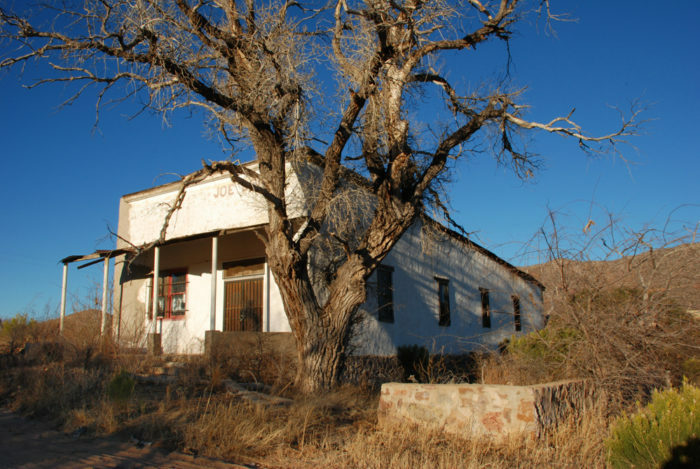 After exploring Charleston, Millville, and the San Pedro River, you’ll head back 18 miles to Tombstone and then west to Fairbank, another ghost town and our last stop. 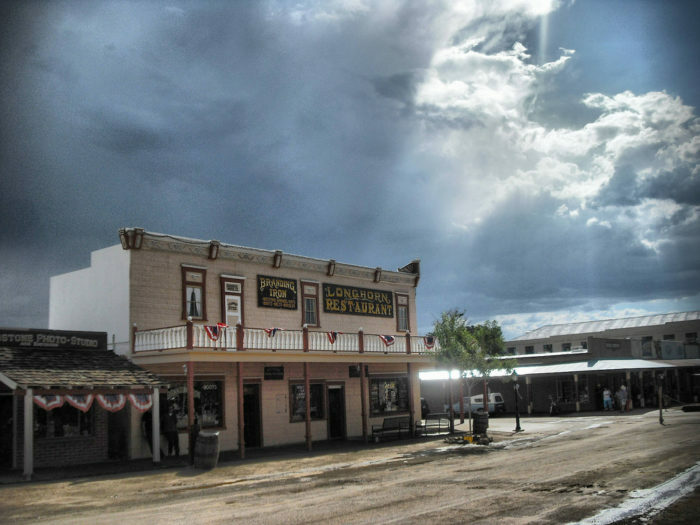 The town was settled in 1881 as the nearest railroad stop to Tombstone. 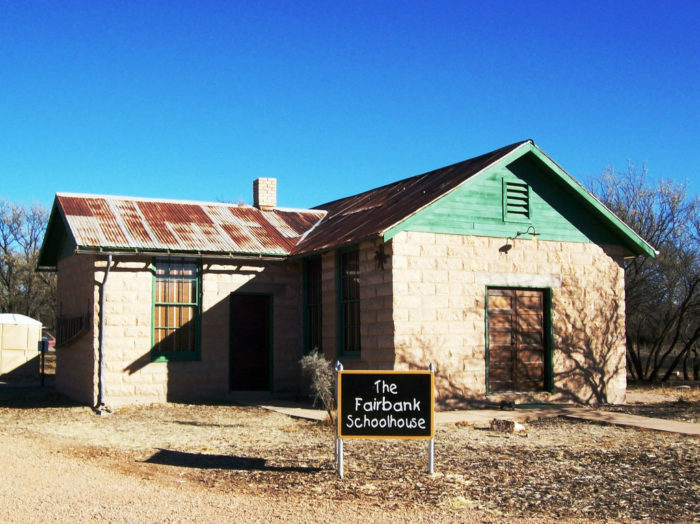 Because of this, Fairbank became an important commerce depot and stage coach station for travelers. 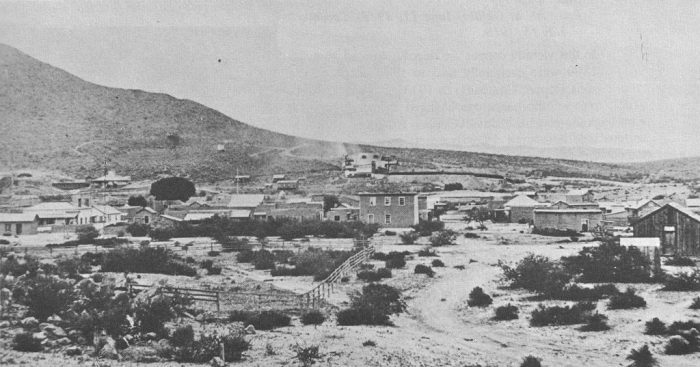 As with Charleston, that economic boom only lasted a few years until Tombstone’s mines flooded but it was given a second chance when the railroad connected to Bisbee. Over time, however, the town’s population declined and it was finally abandoned in the 1970s, a life much longer than many of the surrounding towns. Today, you’ll find quite a few buildings still standing in Fairbank and some have even been restored, thanks to the Bureau of Land Management. This includes the old schoolhouse, which underwent restoration in 2007. Other building to check out include the remnants of the Montezuma Hotel, houses, a commercial building, and an abandoned railroad bridge. The BLM has a map with information about some of the buildings on their website. Expect to spend an hour or so on a self-guided tour of the area. Sounds like quite a trip, doesn’t it? If you want to explore other areas of the state through a road trip, be sure to check out some of our previous articles for ideas!